The BVI Football Association was among 41 CONCACAF members celebrating Women’s Football Day on the new pitch in Greenland, marking the first women’s event to be staged there. 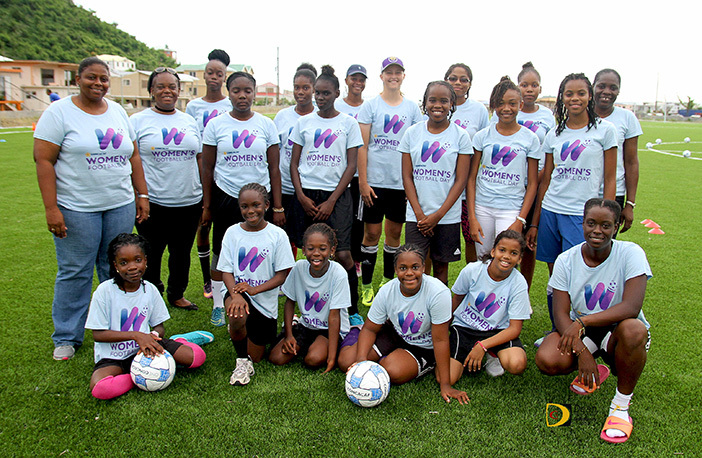 About 25 women from Tortola and Virgin Gorda, ranging from about 9-40+ participated in the event. BVIFA president Andy Bickerton said that while they join their regional counterparts in the event, in their case as well as French St. Martin and Dutch St. Maarten, Anguilla and Dominica, it has been a challenge putting the event together because of the devastation in the respective countries, because of the challenges faced in the aftermath of Hurricanes Irma and Maria. According to Bickerton, a lot of resources are now being put into these areas in the Caribbean region. On the men’s side of the sport, he said a tournament involving all of the teams in CONCACAF will begin shortly leading to the 2018 World Cup. From 2018, the stated, the men’s team will be playing 10 games a year minimum. With several new faces among the women, he said that over the next five years, they can look forward to seeing a women’s league established. “This means a lot of opportunities with a minimum of four games at home and four games away,” Bickerton said. Virgin Gorda’s Jakeisha Rigobert, who served as Captain of the U17 Women’s team, encouraged he fellow players to continue in the sport despite the recent challenges they have faced from the two hurricanes.